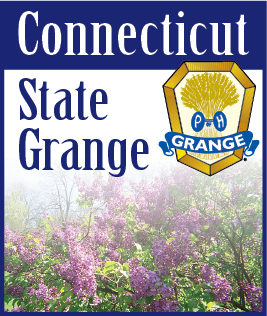 The 2008 session of the Connecticut General Assembly will begin on February 6 and must adjourn no later than midnight on May 7. Meanwhile there is much activity at the Capitol as both legislators and lobbyists prepare for the coming session. The Working Lands Alliance, a coalition of more than 100 organizations including the Connecticut State Grange and several Pomona and Subordinate Granges, is drafting its plan to lobby for the preservation of our rapidly diminishing farmland. It is often said that politics makes strange bedfellows. The Working Lands Alliance will endorse the “Face of Connecticut” campaign along with the groups that support the preservation of open spaces, historical preservation and affordable housing. Each of these groups has an interest in the “Face of Connecticut” program to maintain our state as a desirable place to live and work. The program will commit $20 million each year for farmland preservation over the next ten years. It will also provide new funding to help new farmers get started and for the protection of “locally significant farms” that do not meet the minimum requirements to be considered in the State’s existing farmland preservation program. The Working Lands Alliance will oppose any use of state funds for economic development that will lead to the permanent loss of primae farmland. Cleared, level, well drained land is essential to Connecticut’s agriculture, but is also the least expensive to develop for other uses. Many of the problems our farmers face today are the direct result of prime farmland that has been developed for housing, shopping centers and industry. Many local board and commissions do not understand agriculture and pass regulations that have major adverse effects on farmers. In most cases the local boards and commissions are not opposed to agriculture nor are they trying to force local farmers out of business, but that is the result of their actions. The Working Lands Alliance therefore recommends the creation of a new state-level review process to examine all proposed municipal and state regulatory changes that impact agriculture and its use of farmland. Many farmers want to see their land preserved, but the tax laws often impose great burdens on them for preserving their land. If a farmer sells the development rights to land he or she has owned for many years, the value of the development rights today is significantly more than the farmer originally paid for the land. In these cases the farmer must pay capital gains taxes on the money received from the sale of the development rights. If a person who owns farmland donates the development rights and then finds they must apply for Medicaid within the next five years, they are ineligible for any Medicaid assistance for a period of time because of the value of their gift to either the State or a land trust. The Working Lands Alliance will urge that the state capital gains tax be on a sliding scale for the sale of easements to preserve farmland and that the Connecticut Medicaid regulations be revised to exempt people who donate farmland preservation easements from the present five year “look back” period for significant gifts and transfers of assets that trigger a period of ineligibility. Dairy farms occupy the largest portion of the preserved farmland throughout Connecticut. Most of our dairy farmers are finding it very difficult to sell their milk for as much as it costs them to produce it and many are selling their herds because they can no longer afford to stay in the dairy business. If the former dairy farmer does not find another use for his or her land, it sits idle and soon reverts to brush and then to woods. Preserving farmland from development does not preserve it from mother nature. The Working Lands Alliance will therefore lobby for measures to insure the long term viability of Connecticut’s dairy industry. This will provide important environmental and community benefits in addition to insuring a fresh supply of local dairy products. The Working Lands Alliance is composed of many diverse groups and organizations concerned with preserving Connecticut’s farms and farm land. It will work with other diverse groups throughout the 2008 session of the General Assembly to help insure the continued viability of Connecticut agriculture to provide locally produced food to feed our growing populations while at the same time protecting and preserving the beauty of our countryside.